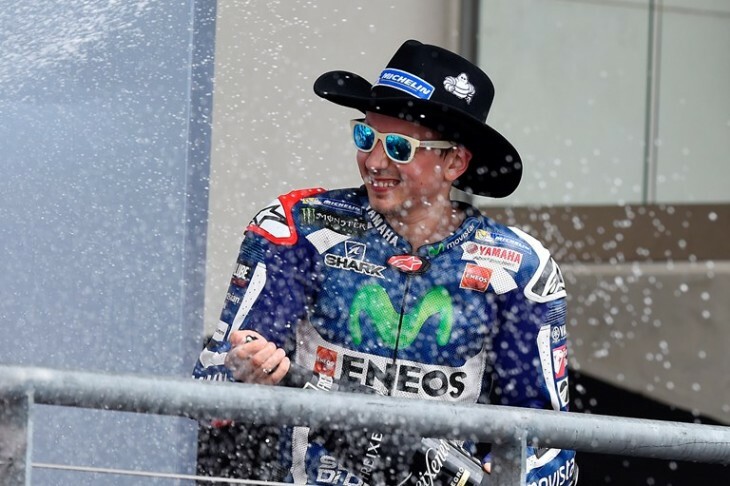 Movistar Yamaha MotoGP rider Jorge Lorenzo delivered a brilliant ride today to stay ahead of the main pack and hold on to second place on the podium for the Grand Prix of the Americas. Teammate Valentino Rossi had a difficult start with a slipping clutch but recovered to chase the front pack until losing the front at turn two of lap three, ending his Texas adventure. Movistar Yamaha MotoGPs Jorge Lorenzo delivered a superb performance to secure second on the podium in the Grand Prix of the Americas at the COTA circuit in Texas. A typical start for the Spaniard saw him grab the holeshot from second on the grid and lead into the first corner. The high pace at the front left him running wide for a couple of corners as the race found a rhythm, dropping as low as fourth before quickly recovering to third to begin hunting Andrea Dovizioso in second place. With 17 laps to go he was able to make his move up into second but was unable to match the race leaders speed. The seasoned GP rider then rode an intelligent race, carefully increasing the gap to third behind him to over 10 seconds at the line for 20 valuable championship points. Valentino Rossi was disappointed to exit the Texas GP early after finding arguably his best for yet at COTA. A slipping clutch from the start grid complicated his progress for the first few laps, but the nine-time champion was coming back strongly on lap three and beginning to close the gap to those in front. Rossi was battling between fifth and sixth position when he lost the front on turn two with 19 laps to go, ending his Texas adventure. The race results see Lorenzo move up from fourth into second place in the championship standings on 45 points, with teammate Rossi dropping one place to third and remaining on 33 points. The MotoGP Championship now heads to Jerez in Spain for the first European Grand Prix of the year on 24th April. Monster Yamaha Tech3 team rider Pol Espargaro delivered a resolute performance to finish the Grand Prix of The Americas in a well deserved 7th place in front of approximately 56,000 passionate fans. The 2013 Moto2 World Champion kicked off his battle from 13th on the grid and undertook a positive start before bringing himself right in the mix in the fight for the top independent rider. He continued his strong pace and by lap seven he had risen up to 10th. After moving ahead of the group, Espargaro dug deep and set a series of consistent lap times to gap the pursuing riders and with the 21-lap lasting competition drawing to a close, the Spaniard remained cool and eventually sped over the finish line in 7th. The result leaves him fourth in the 2016 World Championship standings and Monster Yamaha Tech3 third in the team standings, ahead of the MotoGP paddock returning to Europe. Meanwhile, on the other side of the Monster Yamaha Tech3 Team garage, Bradley Smith suffered bad luck in the round three battle despite producing a thorough effort in the race. The young Briton began the Grand Prix from the fourth row on the grid after a determined display in qualifying yesterday. When the lights flicked off, Smith bolted forwards and quickly set into his rapid rhythm as he looked to clinch a strong point scoring finish. By lap 8, he was up to 8th and had closed in on the three riders in front of him yet, his luck ran dry and he fell at the 11th turn. Nevertheless, the determined 25-year-old remounted and pushed all the way to the chequered flag, but eventually completed the race in 17th due to a damaged gear lever. The 2015 fastest satellite rider will now seek to bounce back strongly at the next GP at the Circuito de Jerez.